At Gleason & Associates, Inc, in Detroit, Michigan, we offer professional asphalt paving services. Contact our asphalt contractors today for more information. When your parking suffers from bad asphalt, the Gleason and Associates Inc. team is on the job. We'll excavate bad asphalt and replace it. Ask about resurfacing and paving—this cost-effective alternative involves covering up old asphalt. We excavate parking lots and repave at an average thickness of three inches, or we resurface parking lots with one and a half inches to two inches of asphalt. Whenever re-capping cracked asphalt, reflective cracking will occur. However, this is a cost-effective alternative to replacement. The most economical way to improve the function and appeal of your parking lot is spot repairs. With spots repairs we simply fill in the holes and area immediately surrounding hole with hot commercial grade asphalt and machine roll. Capping around the hole prolongs the life of the repair. If area around hole is severely cracked then we'll have to dig it out prior to filling in area. Because spot repairs are rolled shortly after installation of asphalt, there is rarely an interruption in your traffic flow, since in many cases, the rolled patch can be driven on within minutes of being machine rolled. We apply a bond emulsion to your old asphalt to enhance bonding of old to asphalt. 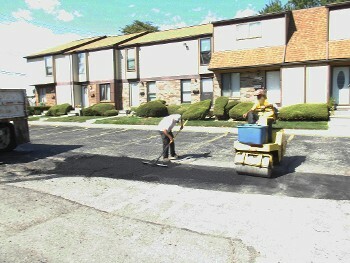 Contact us for information on parking lot maintenance ans asphalt repair.